From September 4-November 6, 2018, Priests for Life invites believers to pray an Election Prayer for Life. This prayer card will only be availabe while supplies last. Each pack contains 100 prayer cards. 30 days of scriptures, meditations and prayers, compiled and created by the members of the National Pro-Life Religious Council out of love for Christ and his Church. At Eucharistic Adoration, I use "In the Palm of His Hand," and am so grateful to have this volume. 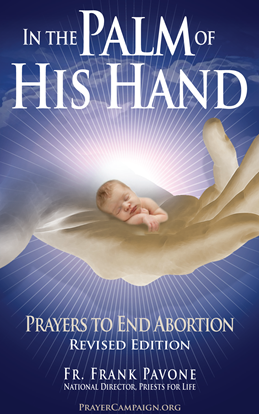 -- Ada F.
Thank you for your longstanding witness to life and especially for your Booklet: "In the Palm of His Hand." While praying with this booklet many times during exposition of the Blessed Sacrament in our parish, Holy Spirit moved me to a much deeper awareness of life within me. – Carol, Gignac, CT.
Fr. Frank Pavone's book, Pro-life Reflections for Every Day, will enrich your daily prayer life with new vigor to stand up for the unborn! This is a devotional prayer book, one of the "Spiritual Life" series that Catholic Book Publishing Company has produced for years. The book is 192 pages with vinyl binding and ribbon. In exchange for one minute a day, your spiritual life will be nourished throughout the day with pro-life vigor! Click here to read more praise and endorsements for Pro-Life Reflections for Every Day. Pope John Paul II was beatified on Sunday, May 1, 2011 and canonized on April 27, 2014. He was the “Pope of Life.” As a sign of gratitude to God for giving us this Pope of Life, and as a sign of our commitment to study and live his teachings and follow his example, we invite you to say this prayer frequently. 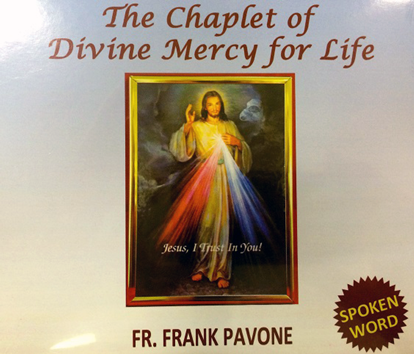 With this CD, you can pray the Chaplet of Divine Mercy along with Fr. Frank Pavone, who reflects on the link between Divine Mercy and ending abortion. Copyright © 2019 Priests for Life Online Store. All rights reserved.